Golledge excels at emotional description as she weaves a complex tale of family and loyalty in a strange new world. Authors of novels that combine science fiction and fantasy often create richly layered worlds, but sometimes the nuances of those realms are clear only to their creators. 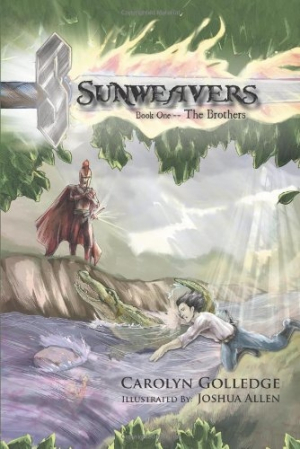 Carolyn Golledge’s Sunweavers: Book One—The Brothers expertly raises issues about what family means and standing up to foes, while at the same time it creates a fascinating world that is sometimes difficult to grasp. Two men known as Weavers, Bren and Taran, are separated when an invading army tortures Bren to learn the secret of immortality. Meanwhile, in another land plagued by the same invaders, brothers Kerell and Parlan must reluctantly fight for the enemy army. Golledge, a seasoned science-fiction writer who has contributed to the Star Wars Adventure Journal and built her own publishing house, depicts brotherhood intriguingly. Bren and Taran’s bond comes from shared ability and training, whereas Parlan’s family adopted Kerell after his parents died. Although neither pair are blood brothers, their loyalty, protectiveness, and affection toward one another demonstrate the true definition of brotherly love. The author deftly delineates the difference between the earth-loving magical realms of Rogha and Lellgha versus the environmentally destructive, imperialist Myrrgha. However, difficulty arises in the book’s world-building in general because the extent of the Weavers’ powers is never fully revealed. They draw energy from sunlight, operate in pairs, and harness their power by singing; however, their abilities seem to change as the plot requires. For example, Weavers aren’t telepathic until the skill becomes necessary to advance the story. New races of people and important objects pop in and out of the story without adequate explanation of their purpose. It takes too long for the stories of each pair of men to intersect. When all the pairs do finally meet each other, the transition from suspicion to trust happens too quickly—most of the book up to that point deals with the two pairs as separate entities. The summary on the back of the book gives no context for the complex world Golledge creates, potentially confusing and limiting the book’s potential audience. But those who work their way into the story will be well rewarded with a timely tome about the horrors and senselessness of war and the undying nature of loyalty.